A Russian nail salon has been slammed as ‘sick’ and ‘cruel’ on social media after posting photos and videos of live ants crawling inside models’ hollow acrylic nails. Moscow-based Nail Sunny beauty salon has built a reputation for pushing the envelope, and several of their quirky ideas have gone viral on social media like Instagram or Facebook in the past. However, they may have gone a bit too far with their latest creation – hollow acrylic nails that act as display cases for live insects. While some of the salon’s 1.8 million Instagram followers commended its staff for the original idea, the vast majority of comments were negative. “What the hell is wrong with you? This is clearly animal abuse. If someone would put you in this damn nail you wouldn’t be that happy!” one person commented on the controversial Nail Sunny video showing off the fake nails. “This is sick! Horrible. You should be ashamed,” another Instagram user wrote. Whoever manages Nail Sunny’s Instagram account tried to mitigate the damage by posting that no animals were harmed during the making of the video and that the ants were able to breathe inside the hollow nails. However, this only riled people up even more. “No animals were harmed?! You mean insects? And either way it can drown in the chemicals. You are disgusting!” one person responded. “So y’all gonna have dead ants living in your nails for 2+ weeks? Cancelled!” another fan wrote. 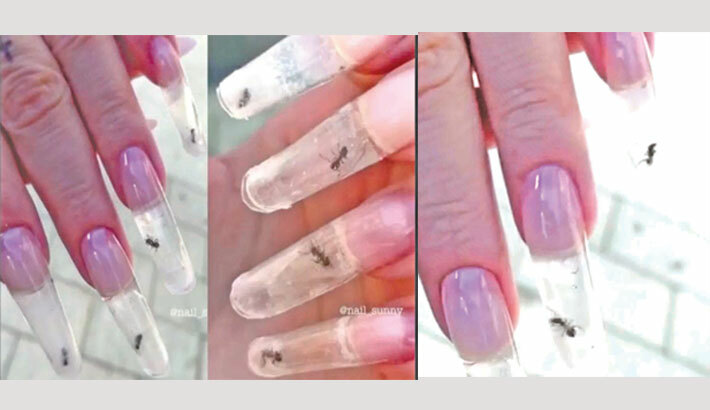 Nail Sunny posted a video of the entire process behind the controversial fake nails, from attaching and molding the acrylic into a hollow tube, to catching the ants with tweezers and eventually sealing them inside. However, following the negative reactions on social media, the beauty salon posted a follow-up clip of the ants being removed from the nails and released. ‘We left them to breathe!’ the video caption read. Unfortunately, the second video did little to calm the waters. “You think this makes it better? How would you like to be shoved inside a plastic box with no explanation, flashed and photographed then thrown on the ground? I wonder how traumatised you’d be after being stuck in an airtight container. It doesn’t matter if they were only there for a second, even though we know that’s not the case because the video is longer,” one person commented.